I'm a kind of quiet and reserved guy, and while I often frequent the same eating and drinking establishments over and over again, my personality ensures I never really become that "regular" every knows and greets upon arrival. While this holds mostly true, one exception is an excellent food truck called Bo's Kitchen that's often in our neighborhood, where the owner instantly recognizes and chats with myself and the wife. We were so excited when Bo's Kitchen expanded into a brick-and-mortar recently, called Namu, which has now become a usual hang out spot for us. On a recent visit there, I ordered a menu special of bulgogi fries, which were waffle fries loaded with your choice of meat, kimchi, scallions, spicy Korean barbecue sauce, and more. I devoured that oversized platter in no time, and while waiting for those more graceful and normal paced eaters to finish their meals, I got to wondering—why are Korean fries and tacos such a big thing, but not walking tacos? 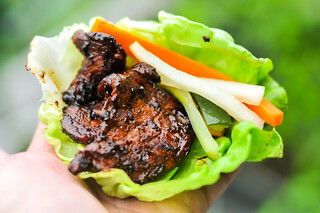 So I knew what I had to do with that thought—make some Korean barbecue walking tacos at a Meatwave! Like at Namu, I wanted to give my guests a choice of toppings and decided to do both beef bulgogi and daeji (spicy pork) bulgogi, as well as offering both of those in tofu form. 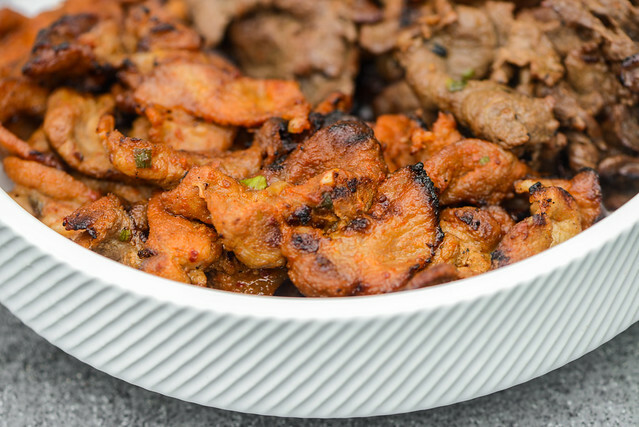 I've worked on recipes for each type of bulgogi in the past, but knowing more about Korean cooking now than I did then, I figured I could improve on the recipes. I'm going to focus on the spicy pork for this post, and I began building a better recipe by switching from the pork loin I originally used to fatty and more delicious, thinly sliced pork shoulder. Pork shoulder prepared in this manner is usually easy to find at Asian markets. 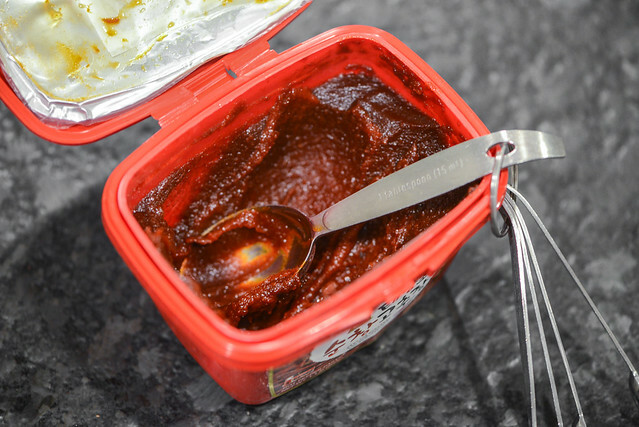 Gochujang, a Korean fermented spicy pepper paste, forms the backbone of this marinade. This is probably my favorite pepper sauce in the world and I use it all the time in many applications (it's especially good on wings) and am happy to see gochujang become more common in everyday grocery stores nowadays. 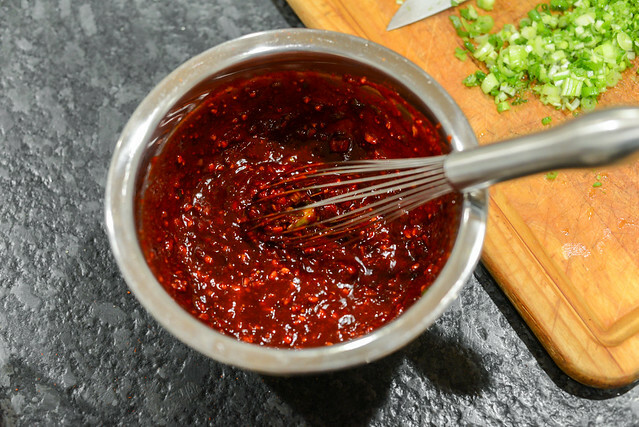 While gochujang provided the immense spicy and slightly salty foundation of the marinade, a few supporting players went in to build up a really layered and complex sauce. As a foil to the heat, I used brown sugar and mirin for touches of sweetness, soy sauce for extra savoriness, garlic and ginger for their distinctive sharpness, sesame oil to add a roasted nuttiness, and then scallions for the onion component and some Korean red pepper flakes, because more pepper couldn't hurt something meant to be spicy. I placed the pork shoulder slices in a bag and poured in the sauce. I then sealed the bag and massaged the meat to get the sauce to completely coat it as much as possible. Then into the fridge it went, where I let it marinate overnight. I haven't personally tried it, but I bet just an hour or two would also do the job because the meat is so thin and the sauce so powerful that I doubt longer times really result in a lot of additional flavor. I used to think Korean barbecue wouldn't do well on a normal grill since the small pieces of meat could easily slip through the grates, but I've disproven that time and again over the years. Sure, I may lose a tiny piece here and there to the fire, but mostly this thin pork grills up with no issues. I used a fresh, really hot fire here to get the pork to cook quickly and develop some char while doing so. Since pork shoulder is fatty, it can take overcooking, so I'm really grilling here for the right color and caramelization rather than exact doneness. As the pork finished cooking, I transferred it into a serving bowl, which you can see here with the other side filled with the beef bulgogi I was grilling up at the same time. Then once the pork and beef were all done, I set the bowl out and let the walking taco assembly begin. Fritos is usually the chip of choice to make walking tacos, although I offered potato chips and Cheetos as options as well. To make mine, I cut off the top of the Fritos bag along the longer side, and then piled in daeji bulgogi. I topped that with some pureed kimchi, cilantro, scallions, and a hearty drizzle of a spicy Korean barbecue sauce. The toppings are totally up to you though, but I can say this combo was spot on. 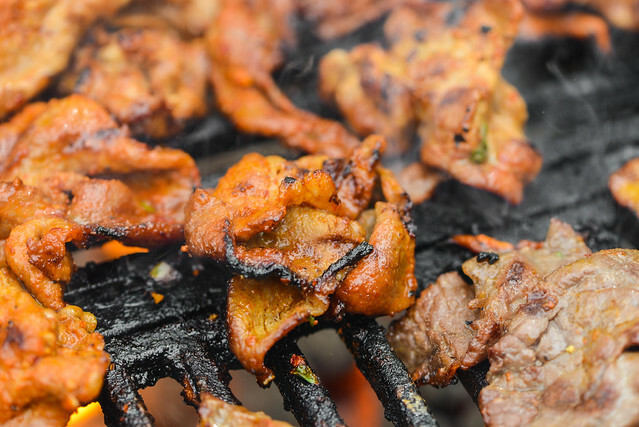 If you're a spicy food lover, as I am, the double dose of hot items is killer—with the pork delivering a very different spicy experience than the hot sauce condiment. Cilantro and scallions were key in adding some freshness, while the kimchi had a sour and pungent flavor that was strong enough to come through the waves of heat. And lets not forget those Fritos, which added a corny, salty crunch whose intensity worked with all the other very prominent flavors already going on. 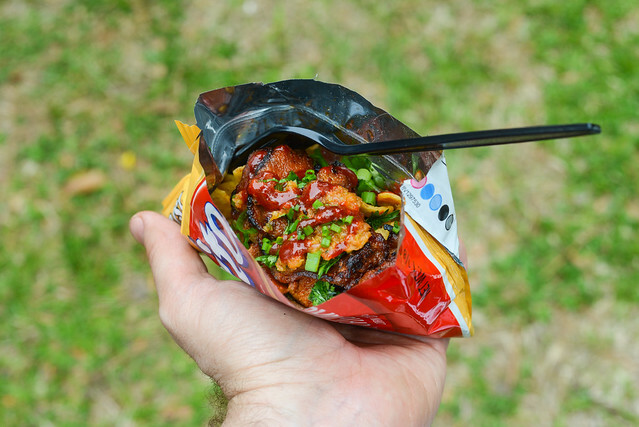 So yeah, Korean walking tacos are totally a thing that should exist and I hope they'll be as much of a crowd pleaser in your backyard as they were in mine. Korean barbecue with all the fixins piled into a bag of Fritos is glorious thing. To make the sauce: In small bowl, whisk together gochujang, brown sugar, soy sauce, vinegar, mirin, gochugaru, garlic, and sesame oil. Transfer to an airtight container and store in refrigerator until ready to use. 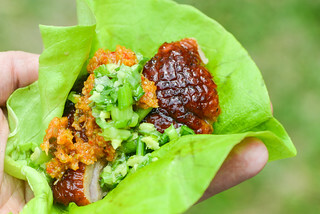 To make the pork: In a small bowl, whisk together gochujang, soy sauce, brown sugar, mirin, gochugaru, garlic, ginger, sesame oil, and scallions. 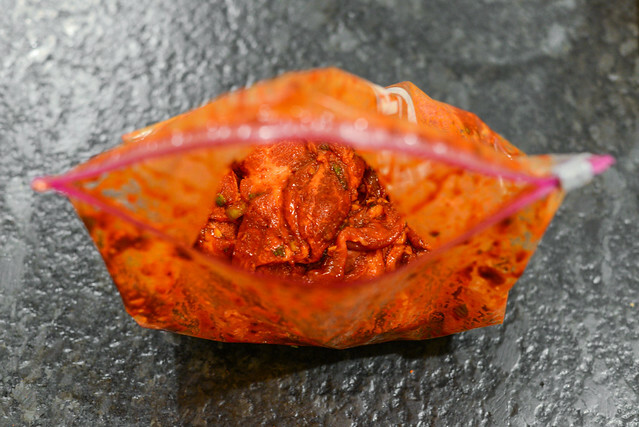 Place pork in a large resealable bag, pour in marinade, seal bag and toss to even distribute marinade. Place bag in refrigerator and let marinate four hours to overnight. Light one chimney full of charcoal. When all the charcoal is lit and covered with gray ash, pour out and spread the coals evenly over entire surface of coal grate. Set cooking grate in place, cover grill and allow to preheat for 5 minutes. Clean and oil the grilling grate. 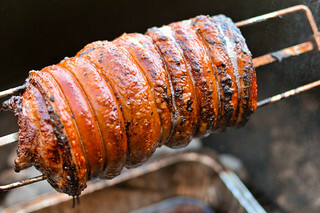 Place marinated pork on grill and cook until lightly charred and cooked through, flipping meat occasionally, 3 to 5 minutes. 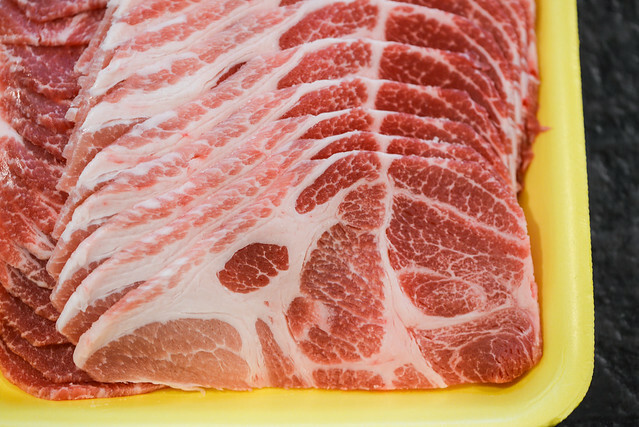 Transfer pork to a platter or bowl. Cut open Frito bags along longest side. 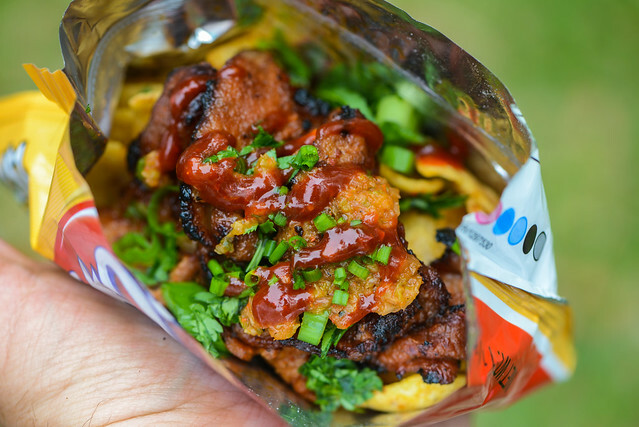 Top Fritos with pork, kimchi, cilantro, scallions, and the spicy sauce. Serve immediately. Made this last night. Scratched the Korean BBQ itch quite well. Thanks for the recipe! @Alex Glad these turned out well for ya! Can't wait to try! Looks and sounds killer! Making my mouth water. Why oh why I open this website when hungry in China. First thing I always do after flying back to CA is make some tacos. Got to try these Korean version this time.